Japanese Episode DP 177: "The Decisive Battle! Hikari vs. Nozomi!!" American Episode 1320: "A Grand Fight for Winning!" Hikari and Nozomi meet on the final stage of the Grand Festival! The battle to decide who will be the next Top Coordinator is between Hikari's Potchama and Togekiss and Nozomi's Nyaruma and Ellade. Nozomi takes an early lead by thwarting a combination attack, but Hikari is able to bounce back with a combination of her own. Later, Nozomi has her pokemon draw all of Hikari's attention to Ellade to give Nyaruma the chance to sneak onto Togekiss' back. Hikari's losing points the more Togekiss thrashes about, so she has Potchama Hydro Pump the cat pokemon off its partner. As the match approaches its time limit, Nozomi has Nyaruma use 10,000 Volt to power up Ellade's Psycho Cutter while Hikari combines Togekiss' God Bird with Potchama's Peck. After a spectacular collision, the match ends and Nozomi is declared the winner! 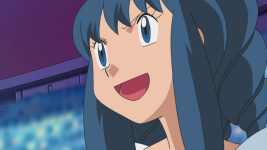 Hikari congratulates her rival and thanks her pokemon for all their hard work. Musashi, upset that Hikari lost, ditches her Candy Musalina persona and decides not to be a Coordinator anymore. After the battle, a Joi approaches Satoshi and tells him that Denji called to say that the preparations for his Gym Battle are finally complete. Later, Hikari meets Nozomi and Naoshi outside. She tells Nozomi that she's going to stay with Satoshi to cheer him on and wishes Naoshi good luck on reaching the Shin'ou League. As the curtain closes on the Shin'ou Grand Festival, Hikari looks forward to the day when she can call herself a Top Coordinator. This is the last hurrah for Pokemon Contests. It seems so surreal to actually be typing that out, but we really seem to have arrived at that point. The battle in this episode was pretty entertaining even if I did like the Nozomi vs. Naoshi battle a little bit more. This episode continues to showcase combination techniques, and I absolutely love it. There's nothing more boring than watching a battle where the pokemon do the same two or three attacks over and over again, but luckily, this episode managed to avoid that pitfall. The battle in this episode offered plenty of surprises, and I really can't think of too many other things I'd have done differently. Hikari not winning doesn't bother me one bit. For one thing, I've been watching this show far too long to not have seen this coming a mile away. The fact that there are people who get their hopes up that this time will be different is shocking to me. Where have these people been the last thirteen years? Isn't it painfully obvious how this show works now? I also have trouble believing that fans wouldn't have been upset if Hikari had won. She was using a Togekiss trained by someone else, after all, and Hikari winning with that would have been seen as an insulting deus ex machina. I can imagine the fan reaction now. "She wins with a pokemon she just caught? That's so cheap!" "So is this the writer's way of telling us that Dawn couldn't have won the competition by herself? That she needed to rely on someone else's pokemon to win?" "God, Dawn is such a Mary Sue!" The writers were essentially in this weird "damned if you do, damned if you don't" situation. I think they handled this battle well, all things considered, and don't believe that we should be giving them as much crap as they've been getting for Hikari's loss. I am willing to give them crap, however, for the way those lines about Denji being ready to battle Satoshi were just shoehorned in. This is one of the last major Hikari episodes, ever, but they had to add those lines in because God forbid the spotlight stay on anyone but Satoshi for any extended amount of time. I also like how the Joi just happened to know that Satoshi was backstage at the Grand Festival. Because, y'know, where else would he be? The English version has a new vocal song that people seem to love because it's the first new insert song we've gotten since Season 9. Other than that, there isn't really too much to talk about. I remember fans speculating that the Grand Festival will keep all its Japanese music intact because TPCI tends to leave the music alone for big events like this, but that obviously never came to pass. There doesn't really seem to be any rhyme or reason when it comes to which episodes keep all the music and which episodes don't, so we should probably all stop pretending that we know what the hell is going through TPCI's minds. Narrator: "The two winners Zoey and Dawn have advanced to the final round and are about to be part of what is sure to be one of the most important battles of their lives." "One of the most important battles of their lives?" Isn't that kind of overselling that a bit much? Originally, the narrator says that the two Coordinators will give it their all. Dawn: (thinking) "I remember, back at the Jubilife Contest, when Zoey said that we should meet again at the final stage. Those words became my goal, and now look! They've actually become reality! Amazing! I can't thank Zoey enough." Zoey: (thinking) "Dawn's really made it to the final round. But now she's my opponent, and the title of Top Coordinator is on the line. I hope we both give it everything we've got and make this a battle to be proud of." The difference between the Japanese version and the dub is that Hikari and Nozomi are talking (well, thinking) to each other while Dawn and Zoey are talking about each other. It's a very small stylistic difference, but it's one that I feel kind of changes the overall mood of the monologues. Ash and Brock: "Oh wow it's Johanna!" Satoshi and Takeshi aren't nearly as rude; they refer to their elder as "Hikari no Mama-san." During the climax of the battle between Hikari and Nozomi, a newly arranged version of Kimi no Soba de ~Hikari no Teema~ begins to play. This version was first featured on the CD single for Saikoh Everyday! and is sung by Toyoguchi Megumi, Hikari's voice actor. The English version replaces the Japanese song for a new song. No surprise there, really. Fans have taken to calling this new song "The Ultimate Challenge" since those are the only lyrics people have been able to make out. I listened to the song about a dozen time and did my best to get as much of the lyrics down as possible, but a lot of the song is drowned out by the voices and sound effects. [indecipherable] ...to play the game. This is the moment...of our lives! So, surprise surprise, I hate this edit. In Japan, the climax of the battle that Hikari's been working to reach since the first episode is accompanied by the character's theme song, sung by the character herself. In America, that same battle is accompanied by a song that we've never heard before and have no reason to associate with Dawn. This could have just as easily been a song used during, say, Ash's battle against Paul in the Sinnoh League. Nothing about the new song screams "Dawn" to me at all. And the lyrics? I'll admit that Kimi no Soba de ~Hikari no Teema~ is no masterpiece of song writing, not by a long shot. But at least that song was made specifically for Hikari. "The Ultimate Challenge," on the other hand, reads more like a Mad Libs creation than a character-specific song. Like I said before, this song could have been used for an Ash battle and nobody would have thought anything was up. It's an extremely safe, by-the-numbers song that leaves no impact whatsoever. And it's not like dub fans aren't familiar with the melody to the Japanese song, seeing as how it's used as background music all the freaking time. It's absolutely inexcusable that edits like this one still take place in this day and age. While I'm not surprised that this happened, given TPCI's track record and all, it's still painful to see these edits actually being carried out as if we were still in the 1990s. Zoey: "And Dawn, thanks for such a great battle." Dawn: "No prob. It was a blast!" Hikari replies by saying that she's (Hikari) the one who should be thankful. Dawn doesn't offer a similar compliment to her rival in the dub. Dawn: "I'm so lucky to have you all. So let's work hard, and someday, I'll be Top Coordinator!" Hikari is a bit more humble in Japanese, asking her pokemon to bear with her as she tries to become a Top Coordinator. She doesn't emphasize the whole "I'll be Top Coordinator" thing as much as Dawn does.